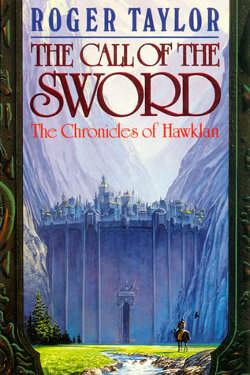 interview Among fans of fantasy literature, Roger Taylor’s Chronicles of Hawklan series is quite beloved, for its sense of “heart” compared with other, more clinical efforts. He has also written a number of follow-up books to the series which are set in the same world. Keeping the Door recommends you check his work out if you’re into good fantasy. The author lives in the UK and is a civil engineer, but also has a number of other past-times apart from writing; according to Wikipedia he is also a pistol, rifle and shotgun shooter, an aikido instructor, and a piano player. He is also now involved in UK politics. Roger has a website, and his books are available from Mushroom eBooks electronically or printed by demand. We caught up with Roger recently to find out what he’s currently up to. What first spurred you to become a fantasy writer? Hard to say – I’ve always been inclined to write. I do remember reading one SF book (which will remain anonymous) which really forced itself on me as being clunkingly awful. It did not prompt ‘I could do better than that,’ but it did result in the revelation – ‘This man might well have written garbage but *I* paid money for it and *he* got money for it.’ That was actually a long time before I started writing but I suspect it planted a powerful seed. What authors have inspired you in the past? Where to start, I’ve read such a lot. Certainly for magnificent writing and imagination – books one would read again – Ray Bradbury, Mervyn Peake, Tolkein come immediately to mind. Plus I soaked up a whole raft of SF and Fantasy when I was younger. When I speak to fantasy fans about your work, a common comment is that it has more “heart” or is “more human” than a lot of other fantasy series out there. What would be your reaction to this statement, and where do you think that sense of “heart” came from in your work? That’s really good to hear. Ironically, one – well, me, anyway – has only limited control of how stories unfold, but it was always my very clear intention to have ‘ordinary’ people in them. Superheroes can be fun, but it’s ‘plain folk’ in extraordinary circumstances that make for real drama. I can remember when I read The War of the Worlds, it was as if Wells had placed one of those towering fighting machines in the little square at the end of the row of houses where I lived – it gave me the shivers. Very ordinary, very vivid – great stuff. When I first read the Chronicles of Hawklan, the nature of Hawklan as a healer rather than a warrior struck me as markedly different from the normal fantasy stereotypes. Can you describe why you chose to form the series around such an unusual, yet poignant, character? Even in 1988 I’d been practising aikido for a long time and with long-term training comes the tendency to think about what you are doing – why are you, in effect, studying violence? – Soldiering, to me, is one of the ‘caring’ professions. Warriors put their lives at risk and use their skills to protect the less able – it’s hard to be more moral than that. Had it not been for countless warriors in the past – again, plain folk – you and I would not have the freedoms we have to communicate and pursue our lives so freely. It’s no small debt we owe them. There is a sense of ancient, majestic sleeping history in Hawklan’s world, especially in Orthlund. Are there certain geographical regions in the real world that you drew inspiration from in creating such a sense? Your writing style is deceptively simple; easy to for fans to get into, but able to convey complexity as well as profound situations. Can you talk a little about how it developed? Nothing special as I have no contracts, though see www.alternativeparty.org.uk – there are a few thousand words there :-) Have a quiet browse now and then, I’m sure you’ll find something interesting. I have a book three-quarters done, but it’s very odd and is currently fermenting. I noticed from your website that the martial art Aikido has been important in your life. What impact (if any) has Aikido had on your writing? See above – and Tai Chi as well. For those of us outside the UK, its politics can be somewhat confusing :) Can you provide a brief overview of your activities with the Alternative Party? Thanks in advance from me and other fans!